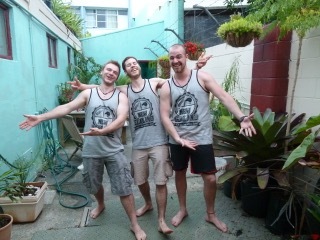 Till, Rueben and Jonas from Germany have stayed here 4 times during their travels around Northland. THE CELL BLOCK became their NZ base and a welcoming place of rest. "WE want to come back before we leave NZ"
For me, definitely the best Hostel in the whole of New Zealand. Wonderful hosts and people. What a great atmosphere ... Love it. All the best for Chrissi & Rian with the Hostel to build it up. I will come back with my girlfriend in September ... Keep going. Franz from Germany.